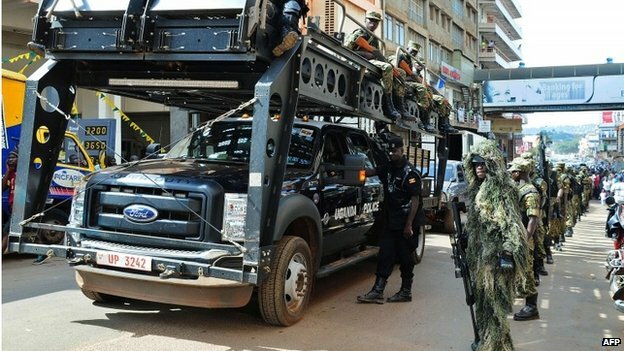 At least 58 people were killed after gunmen launched a coordinated attack on police stations and military barracks in Uganda, the army says. The dead included 41 gunmen and 17 police and civilians. The attacks took place in the west of Uganda, near the border with Congo. The military said the attacks were caused by a dispute between rival tribes, but there are fears over the possible resurgence of a Ugandan rebel movement based in eastern Congo. The attacks targeted security forces in the districts of Kasese, Ntoroko and Bundibugyo. An army spokesman said the attacks were not connected to the Islamist ADF rebel group, which was last active in the area more than a decade ago. “What we know is that this militia is not linked with ADF-NALU but we’re studying them to establish their motives and their backers,” army spokesman Paddy Ankunda told Reuters news agency. Seventeen gunmen were arrested and are being questioned in custody, the police said.